I will admit it. My name is Caroline and I have a pierogi problem. I’ve eaten them in Pittsburgh, I’ve made them at home, and I’ve devoured them at Sophie’s. Sophie’s Gourmet Pierogi is without a doubt my favorite. Because when you get great pierogi + your choice of flavored butter, what’s there not to love? First let’s talk about the pierogi themselves. These potato nuggets wrapped in a dumpling dough are everything you’ve been craving. They pair perfectly with beer too. Sophie’s refers to their offerings as “gastrogi,” because these are not your average Polish treat. Most of the meals begin with the gastrogi, which are griddled until crispy. Sophie’s then tops these guys with your choice of butters, and/or your favorite garnish, making the pierogi anything but ordinary. For butters, get a dollop of lemon basil, smoked paprika garlic, or salami grain mustard to melt and ooze down the pierogi, or keep things simple and add bacon, cheddar, or grilled onions, plus sour cream for dipping purposes. I prefer to add them all! The limited time specials at Sophie’s are memorable too. I’ve sampled the chocolate pierogi at a Rockmill Brewery event, filled with a prune butter and sprinkled with lemon sea salt. Other items such as the Beer Belly sandwich, containing broccoli rabe, garlic, and pork belly, and the Sausage Sandwich (uncovered at the Grain + Grape), is a delight of pierogi, sausage, mustard-chive butter, caramelized onions, are fabulous. I haven’t yet caught up to Sophie’s during brunch, but the Honey Ham and Eggs special of pierogi, eggs, ham, and hollandaise sounds positively sinful. Catch up with this cart at your favorite local brewery or event around town – I promise it will be satisfying and delicious! Have you tried them yet? Let me know what you thought! 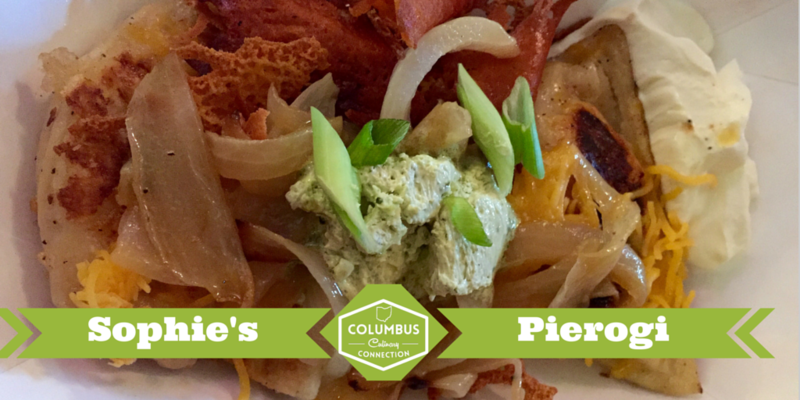 Culinary Clue: Want to have some pierogi of your own at home? 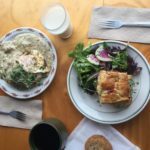 Check out Sophie’s website, where you can order the pierogi in bulk and pick them up for your next family meal or gathering! 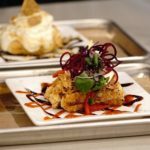 Want to learn more about Columbus food trucks? 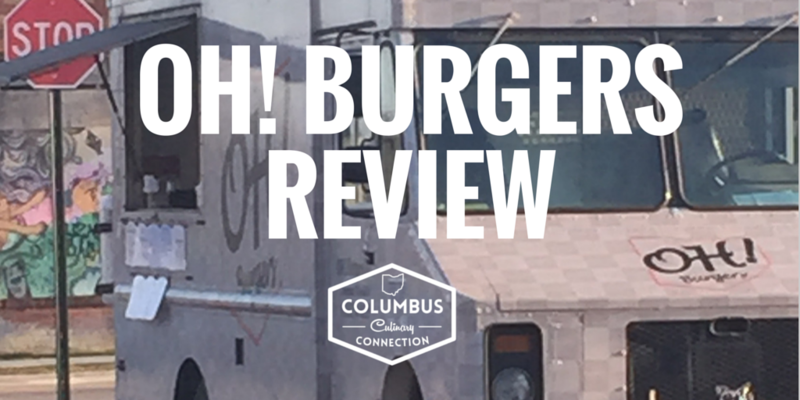 Columbus Culinary Connection has partnered with the Central Ohio Food Truck Association to bring you reviews, updates, and exclusive content about Columbus food trucks. Compensation has been provided, but all opinions are my own. 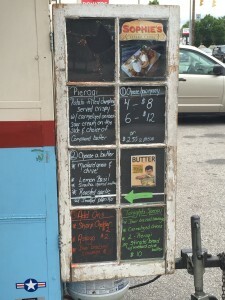 Find out more about COFTA here: http://www.ohiofoodtruck.com/ or download the Street Food Finder app to see where all of your favorite trucks can be located. 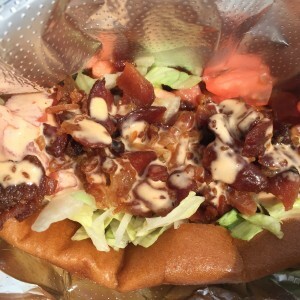 Hot dogs are one of the most iconic food truck items, and in some cases can be pretty boring. 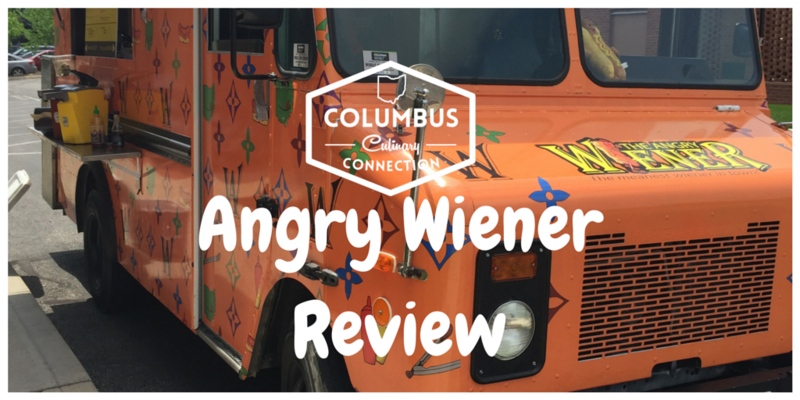 But at the Angry Wiener food truck, they offer more than just a wiener with a squiggle of ketchup and mustard. Track down the Angry Wiener, and sample some of their interesting takes on this classic American cookout food. This food truck has a great mix of both commonplace and inventive hot dog toppings, which will please purists and foodies alike. The buns are really tasty too (an important component in the making of a good hot dog) and are soft and golden, almost reminiscent of Texas toast. 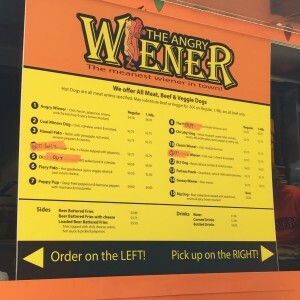 The Angry Wiener’s signature hot dog is also its namesake. Ordering a dog “Angry Wiener style” consists of an all meat wiener topped with chili, bacon, jalapenos, onions, sriracha ketchup, and spicy brown mustard. It is satsifyingly spicy. Or try a West Virginia spin, piling on chili, coleslaw, diced onions and yellow mustard by getting the Coal Miner. Add some crunchy beer-battered fries and you have a complete meal. For those who are more adventurous, there are some daring dogs as well. The Hounddog sounds totally crazy enough to work (peanut butter and bacon jam!) and I loved the BLT version with bacon, lettuce, tomato, and dripping with sriracha mayo. Another fun take, the Peppy Pup, (deep fried pepperoni, banana peppers, marinara, and mozzarella) is messy but so delicious. Vegetarians are covered too, with the ability to substitute a veggie dog in the place of a regular wiener on any sandwich. Culinary Clue: Create a custom dog with your choice of toppings! But if you want a specific topping or signature hot dog, make sure to get there early. 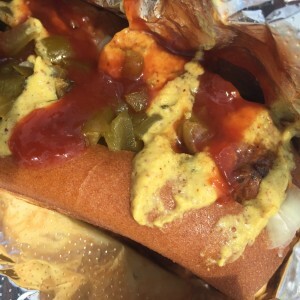 The truck is so popular that is often sells out of the most-beloved items, so get there soon and order up the dog of your dreams! Let’s face it: everyone lovers burgers. 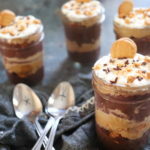 They are delicious, portable, and easy to cram with your favorite toppings. The only thing better than burgers are sliders, because you can sample lots of different kinds of burgers! Fortunately for me, one of my favorite mini-burger joints in town is mobile and often found at local breweries. You may have guessed it – I am referring to OH! Burgers! I tracked down OH! 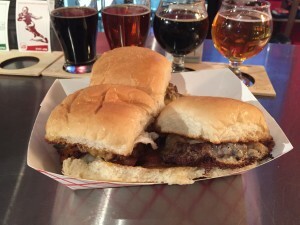 Burgers at Land-Grant Brewing (Hint: Download the Street Food Finder app to see when and where you can catch OH! Burgers or check out the website here: http://streetfoodfinder.com/). These bite-size treats may be little, but they pack a flavor punch. The most important part of a burger is arguably the patty. It is the anchor of the sandwich, and if that component is terrible, it ruins the whole thing. But OH! Burgers’ meat is well-seasoned and high-quality. The signature OH! Burger (beef patty, bacon, cheddar, lettuce, tomato and mayo) and the Vegged-Out (black bean, rice and quinoa burger with lettuce, cucumber, tomato and dijon mustard ) are always on the menu, and the other limited-time sliders rotate in and out. The classic OH! Burger is simple and tasty, and even meat-lovers won’t be disappointed by the vegetarian-friendly Vegged-Out offering. The Carolina BBQ was messy but yummy, dripping with Carolina BBQ sauce, Swiss cheese, and sauteed onions. This was the menu on the night of my visit, but I have also indulged in other burger features on separate occasions. The Spicy PB & J (spicy apricot jelly, peanut butter and bacon) was wonderfully sweet and fiery at the same time, and the Bacon and Blue with beef, blue cheese, bacon, sautéed onions, and sliced granny smith apple was equally satisfying. I am obsessed with anything kimchi lately, so i loved the Spicy Korean, consisting of beef, spicy kimchi from Ajumama Food Truck, pepper jack cheese, and mayo. When it comes to the sides, the chips are ridiculously addictive as well. They were so good in fact, that I scarfed them down before I even remembered to take a picture. 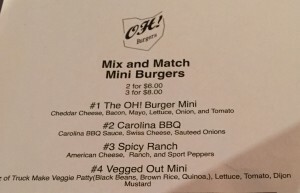 The chips have such a loyal group of followers that the owners of OH! Burgers launched OH! Chips to mass-produce the crunchy snacks. Don’t skip out on trying the garlic dip for the mix of kettle and sweet potato chips, either. Catch up with OH! Burgers at a spot near you soon, and support a local burger business instead of a fast food chain! Culinary Clue: Can’t get enough of OH! Chips? 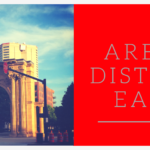 You can find them by the bag around town at places like Strongwater Food and Spirits, The Ohio Taproom, The Hills Market and at OSU Football concession stands. Are you a lover of Mexican food? 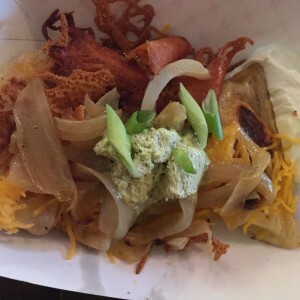 Then I have the food truck for you: Tortilla Street Food! This truck has build-your-own menu items with an infinite number of topping choices. 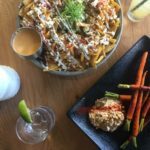 I caught up with Tortilla at The Daily Growler, but you can find them any number of places around town with the new Street Food Finder App. To start, you can pick from a burrito, nachos, burrito bowl, salad bowl, quesadilla, taco bowl, or tacos. 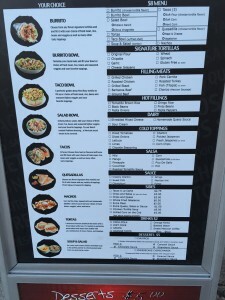 For the tortilla-based items, you get a choice of tortilla flavors, a concept I loved. Select either original, wheat, chipotle, jalapeño, cheese, garlic, or spinach tortillas as your base. 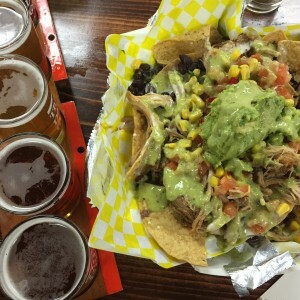 And those nachos – when they say “to share,” they mean it! I got an order for myself, and they were seriously the most gargantuan plate of chips I’d ever encountered. Needless to say, they made amazing leftovers! Now, on to the fillings! Once you’ve got your shell (or lettuce) pick from grilled steak, grilled chicken, shredded chicken, tilapia, carnitas, chorizo, or ground beef. All of these choices were really tasty, but I found the grilled steak and the carnitas to be my favorites. Next come hot toppings, like beans, rice, queso, and fajita peppers. Then, pick from an assortment of sauces and cold garnishes. Cheese, cilantro, tomatoes, corn salsa, chipotle ketchup, pineapples, sour cream, cucumbers, you name it! When it comes to the sauces, the Mexican hot is HOT, but scrumptious! Furthermore, I am such a fan of a creamy guacamole, and Tortilla Street’s is addictive and smooth – don’t pass it up. For dessert, don’t miss the churros (if you still have room). These deep-fried dough sticks are rolled in cinnamon, stuffed with strawberry filling, and served with chocolate or caramel. They are a great finish to a wallet-friendly and satisfying meal. 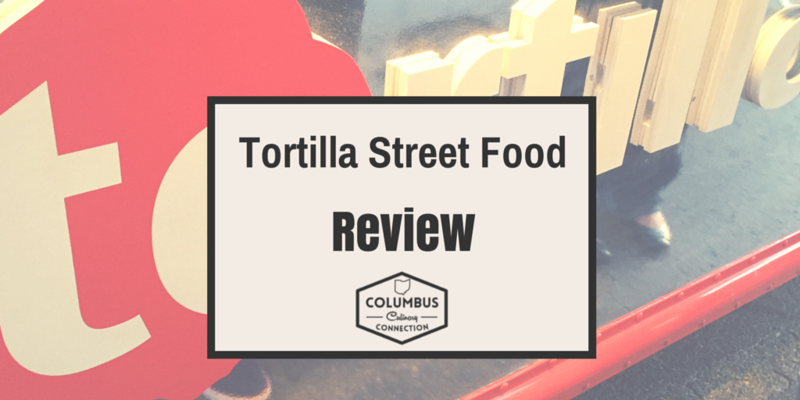 Culinary Clue: Are you looking for Tortilla Street Food or another of your favorite food trucks? Download the Street Food Finder app to see when and where you can catch your favorite trucks. Or check out the website here: http://streetfoodfinder.com/. 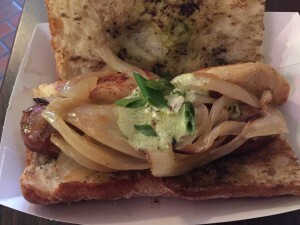 This is the inaugural post in our new monthly food truck series. Click the Food Truck tab for all future posts.